Rolling out, managing and even securing your IT infrastructure can be a nightmare. It is with this that the new Netshield Data Centre in a Box offering, a self-contained IP 54 rated mobile unit that enables a business to rapidly and immediately wheel in, plug in and go, an entire IT infrastructure that can be managed from a single IP address in minutes – will help you change the way you manage your customer sites. The key to the Data Centre in a Box is that it offers businesses a rapid, low maintenance means to roll out an IT infrastructure. Because of its portable and compact build, one can literally wheel it into an office, plug it in and start working. As a reseller you can also manage it remotely, it immediately removes the need to invest in scarce technical skills, hours of configuration, or the necessity to make a large physical investment in a server room. Simply the technology is not completely different to a solution you may “rent” from a service provider. However its built in management capabilities and “smart” security features set it apart from other similar solutions on the market. In short it is a fully self-contained unit, equipped with an air conditioner, access control keypad, electronic locking, Netshield UPS, centre management and control device, temperature monitor, humidity monitor, flooding detection, as well as smoke, fire and flood detectors. Customers can tailor their unit, which means you can request a unit to be built to your client’s specification, and include features such as wireless AP, networking switches, patch panels, wiring, servers and a myriad of additional technologies that can be sourced through Netshield’s partnership with the Westcon Group. The entire unit is then preconfigured and set up by the Netshield technical team before being supplied to its resellers for installation on site at a client. Another aspect that makes the solution so attractive is its ability to, from day one; act as a stand-alone server room, without the extensive investment needed by a bricks and mortar environment. Some of the features included are a UPS, restricted air flows and forced cooling that are also wired into the control system, this is managed from a single IP address. Its IP54 rated enclosure has dustproof and splash proof gasket seals; as well as an enhanced tamperproof electronic locking mechanism that can be locked and unlocked remotely. In addition it also has a full environmental monitoring capabilities that can be executed through the Simple Network Management Protocol (SNMP) on an Ethernet networking interface or sent via SMS’s all through the built-in GSM connectivity module. Because technology these days is required to do your thinking for you, in the event of a fire or even a flood the system will immediately detect the threat and if necessary will shut down firstly the power, air conditioner, check the doors and then release the extinguisher. 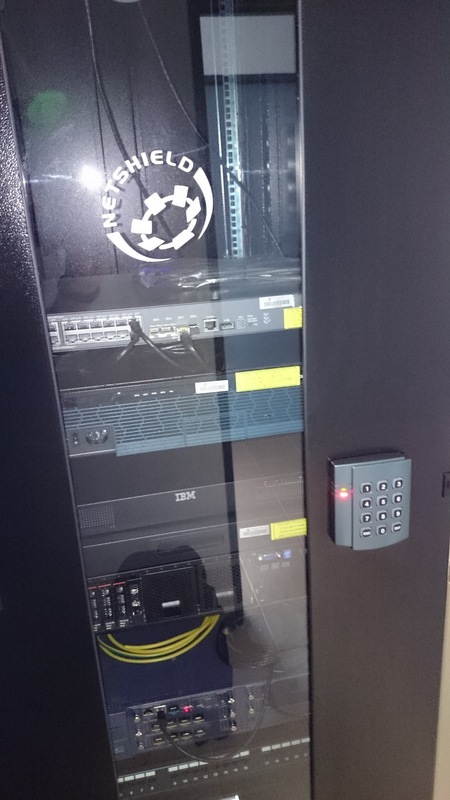 For added security the unit can be programmed to ensure that access is managed remotely, reducing the risk of theft or tampering of the equipment. The last factor is one of the key reasons the solution is currently being used by a major government agency who required an IT infrastructure that could be wheeled in, managed remotely and that was secure enough that it could be tampered with or stolen. The Netshield Data Centre in a Box is available through all Netshield and Westcon resellers throughout the continent and can be customised to include technologies from more than 50 vendor partners from within the Westcon Group.